← Upcoming golf tournaments at Roda Golf! British semi-retired couple Graham and Marion Sanders are the latest full time residents of Roda Golf, and we would like to be among the first to welcome them to Roda Golf and Beach Resort and wish them all the very best for their new lives in Spain. Graham and Marion, originally from Essex, paid their initial deposit for their new dream home in the sun about two years ago. As regular visitors to the area they had a pretty good idea what they wanted from their home in Murcia, and they also decided some years ago that they wanted to live in or near to Los Alcazares. When the plans were first announced for Roda Golf and Beach Resort, Graham and Marion knew at once that this was going to be the place for them. After reserving their property and paying the deposit they have been "wishing their lives away" waiting for their new home to be built! They have now been living in the property at Roda Golf for about six months and it is fair to say they are loving it. Graham has just been appointed Vice President of the community of owners on their phase, and will be responsible for making sure everything runs nice and smoothly for the community. Graham is also responsible, along with good friends Logan, Danny Reilly, Pete and a few others, for the Roda Golf Tuesday and Thursday morning golf challenge, where 5 euros will gain you entry to the 8 or 12 ball competition where winner takes all (the winner must buy the 1st round at the 19th hole) this has now become a very popular competition with many regular visitors to Roda Golf joining the members. I myself have joined them on more than one occasion and it is a real fun experience, the competition is fierce with some real keen golfers in attendance, as well as some very questionable handicaps, you have been warned! Behind every good man there is a good woman and that is certainly the case with these two. Marion's main job is to keep Graham on the "straight and narrow". I am happy to report, so far so good! Graham and Marion can be regularly seen at the Roda Golf clubhouse and gracing the bars and restaurants in the immediate vicinity, La Diva restaurant in the 525 plaza and El Patio 2 are among their favourite eating establishments. 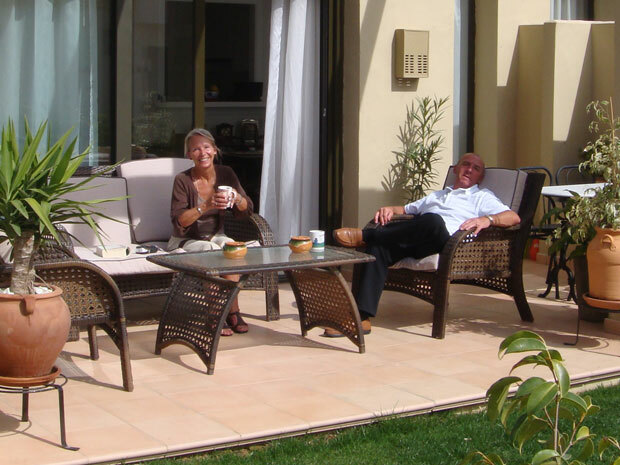 If anybody wants to know about life in Spain and specifically what life is like at the Roda Golf and Beach Resort, we would suggest you search out Graham and Marion Sanders and ask them, judging by the photo above, it is fair to say that life is pretty good for Roda Golf's newest full time residents. Roda Golf - Buy or wait?